If you have worked with Structural Members within ADT in past releases for any length of time, like me you have probably wished for the ability to mass fill out the nodes within a column grid. Unfortunately this has only been possible during the creation of the column grid, otherwise you had to place these one-by-one or create and copy to multiple node locations. Well things have changed for the better in ADT 2006. If you already have a column grid placed you can mass fill out nodes without columns by simply using the ctrl key during placement of the column. There is a red visual indicator shown on the screen, depending on the option cycled to above, indicating the insertion point(s) you are getting ready to use. Video is often a better medium to show examples, so you may wish to watch the following video example. The techsmith codec is required to view the file and is available from the techsmith website. A common procedure within the Project Navigator is the need to change the name/numbering of the sheet file. In past releases of ADT (2004/5) we had the option of renumbering the sheet by simply selecting the sheet>>right click and choosing the rename and renumber option. In 2005 the fields feature was introduced allowing you to populate your titleblock with the associated data, which allows for better coordination. Unfortunately when renaming the sheet title this did not rename the associated .dwg file and lead to some confusion. 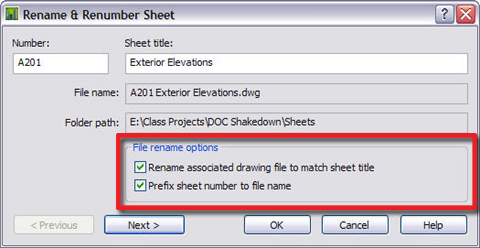 In 2006 there are two new options when renaming which include Renaming the associated .dwg file to match the sheet title and prefixing the sheet number to the file name. Max 7.5 has been released for those on subscription. A few of the notable features include integration of the new features within Viz 2006, Mental Ray 3.4 and Hair and Fur. Shaan mentions some additional benefits of being subscription including: multiple e-learning tools and of course the previously released Cloth Extension for 3ds Max 7. All set to install this over the weekend. This past week has involved traveling to DC, Virginia Beach and Richmond, VA to speak and of course meet with a variety of people and those interested in the latest releases of software from Autodesk. With three tracks for attendees to take (BS, MS, IS) there was a lot of information for everyone. Within the Building Solutions track we had an awesome presentation showing AutoCAD 2006, ADT 2006, Revit Building 8, DWF Composer 2 and Buzzsaw within the pre-design, design, construction and post construction phases and how/where each of the new features plays a role within the Building Lifecycle Management curve. If you were not able to make it out we missed you. There will be some upcoming webcasts for some of the products we did not have time to cover (ABS is one that was requested by several of you). (S1-1) The 12 Hidden Secrets of AutoCAD Productivity Revealed! Productivity is a goal of every AutoCAD user. Unfortunately, using AutoCAD every day does not in itself make you more productive. You improve productivity by choosing the shortest, most efficient technique for each specific drawing problem. Learn how to improve your productivity by tapping into AutoCAD’s hidden secrets and eliminating repetitive steps. Wouldn’t you be more productive if you could eliminate half of the clicks and picks you’re making today? See for yourself the 12 hidden productivity secrets that elude most AutoCAD users. Efficient and effective data management is essential to any CAD project. This course covers the capabilities and applications of Autodesk Vault and Autodesk Productstream for the mechanical CAD area. We will start with a high-level discussion of the reasons companies need effective data management strategies. Then we will look at the useful applications of Autodesk Vault for managing work in process engineering data. Finally, we will move on to the release management and collaboration capabilities of Productstream as we extend engineering data throughout the organization and beyond. With the continuing building boom the need to quickly and accurately develop subdivisions is critical. In this session you will learn how to use the new features in Autodesk Civil 3D for Subdivision Design. Topics covered will include using the parcel layout tools, site grading tool and the corridor model. You will also learn how to use the Civil 3D rendering capability to bring the site to life. This course is designed for civil engineers who want to learn how to get the most out of the subdivision design tools in Civil 3D. In today’s world of building design and construction we are continuously hearing the words data management, document management, drawing management and even building lifecycle management. The question is how this applies to the everyday use of CAD. In the past this was simply done by the use of subdirectories and file-naming conventions. Today Autodesk has embedded tools into Autodesk Architectural Desktop and Autodesk Building Systems that manage this for you. In this session we will cover Building Level Management, Constructs, Elements, Views and Sheet Sets in the Project Navigator. Now you can manage your data with a new level of control. Inventor Version 9 introduced a new concept of how to manage and control drafting standards, dimension styles, layers, etc. within Inventor’s .idw environment. This session explores how you can take advantage of this technology, and the factors that will influence how to best implement it within your company. The class is designed for the beginning or intermediate user of Inventor who has a good foundational grasp of Inventor drawing environment practices. Autodesk Civil 3D Styles provide an incredible opportunity to integrate your company’s CAD standard into your design process. Through integration, standard layers, colors, text styles, and the multitude of considerations that hinder the design process can be automated, leaving you more time to design. This course uncovers the complex structure and hierarchy of Civil 3D styles, giving you the knowledge to build and integrate them into your design process. So if you’re using Civil 3D or Autodesk Land Desktop, or would simply like to learn the next generation of software for civil engineering, attend this session! This session is designed for the working CAD manager who must juggle CAD technology and management problems on a daily basis. This presentation will cover a combination of best practices, useful utilities, outsourcing problems, learning and training strategies, upper management coordination topics and ideas for keeping your overhead low while advancing your career. A special emphasis will be placed on how to tackle standard problems using low-cost methods that even your accounting manager will love. If you have to manage a corporate CAD department and are under pressure to contain costs and stay productive, this class is for you. Learn how to convert 3D drawings into finished, professional-looking renderings using the tools already built into AutoCAD software. This session covers all AutoCAD lighting, materials, landscaping and other rendering commands. We’ll take a typical architectural model and create finished photorealistic images of the building in both daylight and night settings. Client requests for design options have never been greater than they are today. We even hold classes on how to negotiate with clients to keep the number of option requests as low as possible. Within our industry, we know that each design option can cost large amounts of hours and often puts us over budget or causes us to miss deadlines. We have long wanted a way to quickly look at a design option, find an answer and then continue to design, without destroying the work we have already done. In this session we will look at Autodesk Revit and the design option tools that address so many of the industry needs when it comes to design options. (S4-1) The Productivity Power of Palettes Revealed! There is more to Tool Palettes than just a quick way to add blocks and hatch patterns to your drawing. Palettes provide the shortest, most efficient way to increase your productivity without programming and customization. In this session you will learn the hidden techniques to migrate existing toolbars, object styles and macros into Palette Content Tools. Youll also learn how to create and manage shared palettes and palette groups. This session is for any user of AutoCAD 2004 to 2006 who wants to gain a comprehensive understanding of and full productivity using AutoCAD Tool Palettes. It is widely agreed that Autodesk Architectural Desktop’s display control system is one of the most powerful tools available to the building design industry. Understanding the display control system is paramount to any successful implementation of Autodesk Architectural Desktop. In this session we will go from the top to the bottom and all the way around the display controls, so that you can make easy work of the system when you get back to your office. To produce accurate and complex grading scenarios, you'll need to understand the concepts and techniques to convert the traditional approach of grading with contours to today's approach of grading in 3D. We will start with the use of the Grading Objects tool, as well as the use of 3D polylines, in both Autodesk Civil Design and Autodesk Civil 3D. We'll then cover Target Regions, Slope Tags and editing Grading Objects as well as many of the tips and techniques, plus things to avoid. This session is designed for users of Autodesk Land Desktop and Civil 3D with a medium to high skill level, who have a basic understanding of terrain. AutoLISP/Visual LISP is a powerful way to extend AutoCAD’s functionality, but many avoid using it because they think it’s too hard to learn. This course lays out the basics of AutoLISP using a building block approach of practical examples you can use every day to tailor AutoCAD to your specific needs. We’ll cover lists, functions, command definitions, accessing the command line, debugging and how to set up user machines to pull AutoLISP functions from your network. This class assumes intermediate AutoCAD capability and the ability to edit/save files using a text editor such as Notepad. No prior AutoLISP experience is necessary. Do you need to exchange drawings and collaborate with others who don’t use Autodesk products like AutoCAD? Learn how to publish AutoCAD drawings as multi-sheet DWF files and then collaborate using Autodesk DWF Composer. This class covers creating DWF files; using DWF Composer to view, measure and mark up those DWF files; and then using AutoCAD’s Markup Set Manager to view and respond to those markups in a seamless collaboration process. “Did you know you could do that?” is the question you will be asking each other in this class. Short cuts, some basic LISP routines, speed tips, variables and ways of using some AutoCAD commands you might not have thought of...that is what this class is all about. I have been collecting tips and tricks for years and AUGI is my favorite place to find them. Come see some of the latest as well as a few old favorites. You may even have time during class to share some of your own! Looking forward to being back in Omaha, I hope to see you there!